1	Samuel said to Saul, “I am the one the LORD sent to anoint you king over his people Israel; so listen now to the message from the LORD. 2	This is what the LORD Almighty says: ‘I will punish the Amalekites for what they did to Israel when they waylaid them as they came up from Egypt. The above is a Scripture some who oppose Christianity point to in order to illustrate the “meanness” that exists within the Christian God. I admit – this command to wipe out the Amalekites is pretty tough. Saul, Israel’s first king, was commanded by God to completely wipe out the Amalekites from the face of the earth in retribution for their attacking Israel in Exodus 17. This including killing “men and women, children and infants, cattle and sheep, camels and donkeys” – everything. That’s really tough. 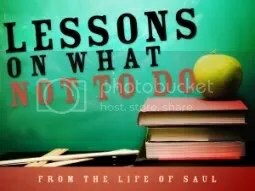 And Saul obeyed God … sort of. Actually he only carried out part of God’s command – the part that made sense to him. The rest I guess he determined God had been mistaken about, and he decided to disobey. In the end, Saul paid for it dearly. A valuable lesson is learned therein. Is God good, just, and righteous? How could He be when He commands one group of people to completely wipe out another? How does God view partial obedience? What are the consequences of partial obedience? For more, visit westcoastwitness.com’s Sermon Archive.